An ambitious plan to save the vaquita from extinction has been put forth by the International Committee for the Recovery of the Vaquita (CIRVA), and it involves relocating some of the remaining vaquitas to a temporary sanctuary. Vaquita swimming in the Gulf of California. Despite substantial efforts by the Mexican government to protect vaquitas, the latest results from advanced acoustic monitoring technology that showed the population continuing to rapidly decline. "We are watching this precious native species disappear before our eyes," said Rafael Pacchiano, Mexico's Secretary of the Environment and Natural Resources. "This critical rescue effort is a priority for the Mexican government and we are dedicated to providing the necessary resources in order to give the plan its best chance of success." The plan will be implemented in the next few months in tandem with ongoing efforts to remove the threat of gillnets in the Upper Gulf of California and eliminate illegal fishing. VaquitaCPR (Conservation, Protection and Recovery) is an emergency action plan led by the Mexican government with the input of a group of conservation scientists and marine mammal veterinarians worldwide. 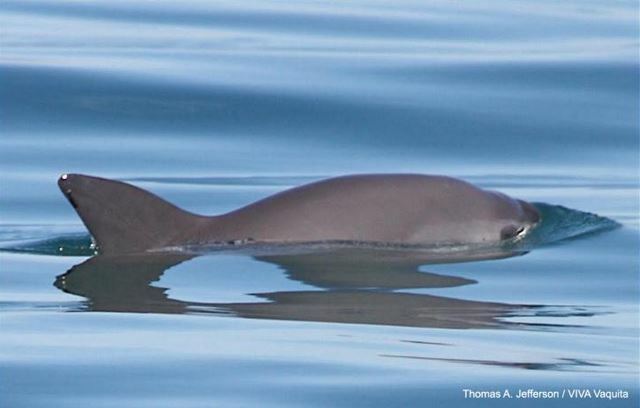 "Experts from around the world have come together and are working to save the vaquita in much the same way conservationists rescued the California condor from extinction in the 1980s," said Dr Sam Ridgway, President of the National Marine Mammal Foundation. There would be much uncertainty involved in finding, catching and keeping vaquitas in a temporary sanctuary. Vaquitas are not only rare, they avoid motorised vessels and no one can predict how they will react. "Unlike condors, we expect that most vaquitas will remain in the wild as capturing even a few will be very difficult," said Dr Lorenzo Rojas-Bracho, lead vaquita researcher and head of CIRVA. "Having some is still better than having none. The decline is happening faster than solutions for illegal fishing, so we need to have multiple strategies."